Knowing who you're hiring is not just prudent, it’s necessary. Your employees are not only your greatest asset and resource, but a quality workforce also increases morale, creates stability, decreases cost, and protects your organization’s image. A quality employee background check is key to getting the most out of your workforce by allowing you to make informed decisions and hire quality employees. However, the process of actually getting a background check on an employee shouldn’t take forever, cost you a month’s profit nor require a secret decoder ring to make sense of the report. Swailes is committed to getting you the most accurate results as quickly as possible while helping you remain FCRA (Fair Credit Reporting Act) compliant, no matter the depth of background check or employee background you choose. Having worked with human resource professionals for over twenty years, we understand getting hiring decisions right isn’t always easy, but having a quality background check report in hand helps. Let us use our experience to handle your backgrounds to help protect your employees, your profit, your reputation and your sanity. 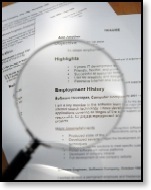 See below for various searches performed in the course of an pre-employment background check. User Friendly Secured Website Access or Deal with a Real Person in the U.S.A.
For additional information, to discuss your specific needs or to sign up today contact Jennifer Swailes at 713-361-4549 or via email.